GS2 sends email updates just 1-2 times a week or based on urgency of action onboard. For ALL updates off the boat OR the latest update please visit the GS2 Facebook Page or the GS2 website respectively. Short cuts available at the right too. As I approach both Cape Leeuwin, Australia and the chronological estimated half-way point of the journey on Monday Feb 1 (Day 67), I am also facing a building gale right in front of me. I was first warned of this yesterday by Commanders Weather who advised me to "Slow Down!" so that the storm would have time to weaken before I got to it. I was initially bummed at this advice because I was going along very fast- say 10-13k- with surfs up into the higher teens- and was gobbling up the mileage. However, when I sat down at my nav table and pulled down a 4-day GRIB weather file and saw the storm, I quickly realized what they were talking about and the wisdom of their advice. Thank goodness for their "eyes in the sky" broader vision of the weather world- I am very lucky to have them looking out for me. 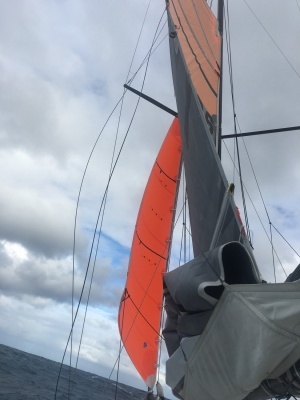 So I took down the staysail this morning and put up the orange storm jib (see photo) for the first time in a long time and tucked the third reef into the mainsail and slowed the boat to about 7.5k. When I run my routing now at 50% of normal expected speed, it shows the worst of the storm (i.e. winds of 50 knots or greater) blowing itself out just before I get to it, so I am looking at 35 to 40k instead of 50-plus. Huge difference. Really hope that is the case. So now I am holed up in the cabin for the next two days as it is already blowing 30k and will continue to do so for the next 48+ hours. So lots of reading, drinking hot tea, and anxiously looking out the cabin windows as the seas build and we get bashed around by the waves. Squalls roll through periodically and the wind increases and a driving, pelting rain falls, which makes it feel like you are going through the car wash having punched the "deluxe clean" option. So I hope you all are getting outside and enjoying the snow (if you have some) and getting some exercise. My time is steadily improving in the 40 foot dash from the bow to the stern, but I could use a little more runway! I will report again once the storm passes on Monday night.